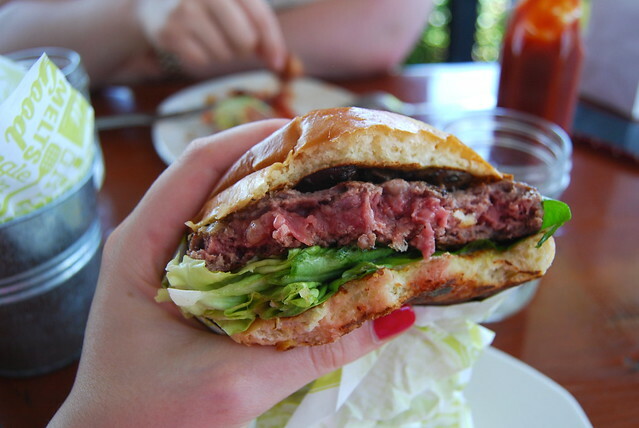 I had been living in Los Angeles for 7 months before I first ventured Downtown. While I love cities like London, Paris and in a whole slew of Scandinavian countries, I really don’t like big, dirty cities where the skyscrapers and massive high rise buildings loom over you, trapping you in. Living on Los Angeles’ Westside with easy access to Venice, Santa Monica, Beverly Hills and West Hollywood I have not really had much reason to venture much further. However, while as predicted I hated Downtown when I got there, only stayed for two hours and will be perfectly happy if I never go back, I am glad I went. Why? 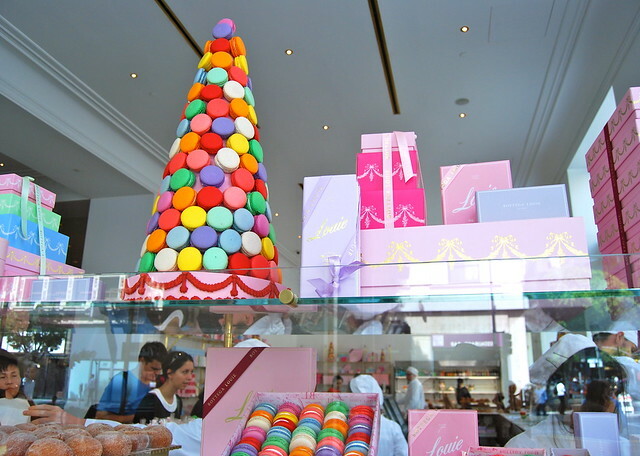 The reason I headed there in the first place: Bottega Louie, the place everyone talks about for French pastries, patisserie and traditional macarons in Los Angeles. 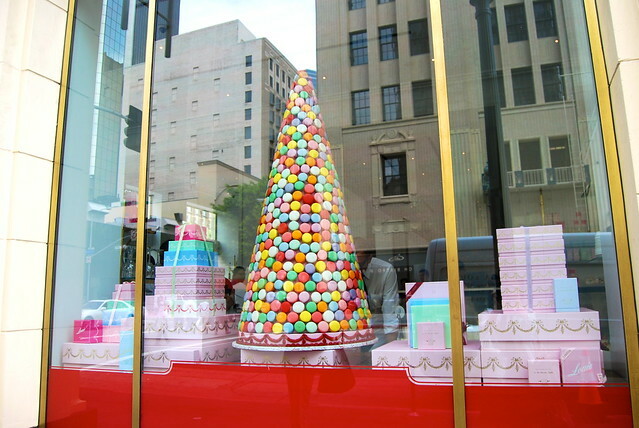 With window displays like this, if Bottega Louie is not a reason for a Westsider to venture Downtown, what is? 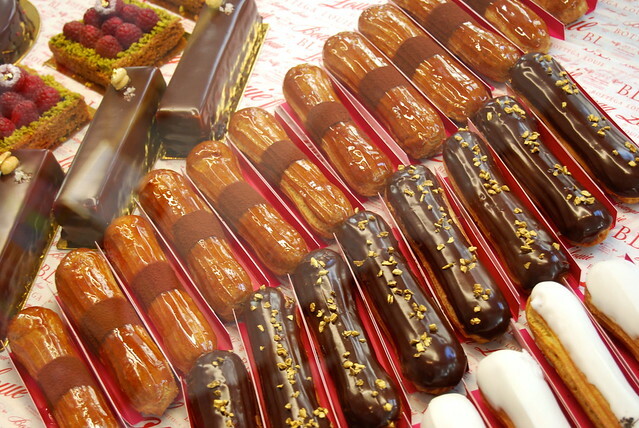 I have not seen eclairs this mouthwatering since I was last in Paris, and that was three years ago! 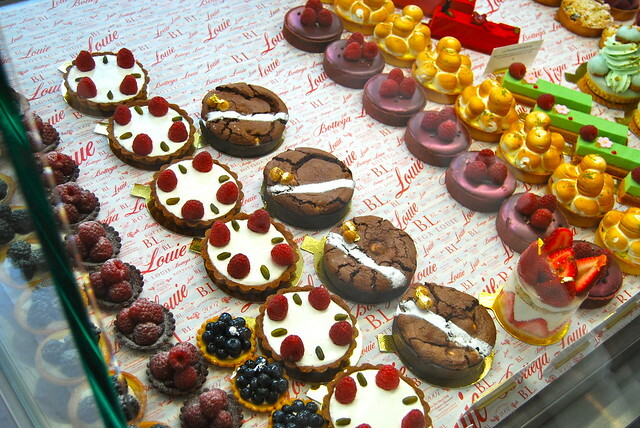 If you are looking for an incredible alternative to a birthday cake (I went to Bottega Louie the day before my 20th, and oh how I wished I could take one of these home with me!) 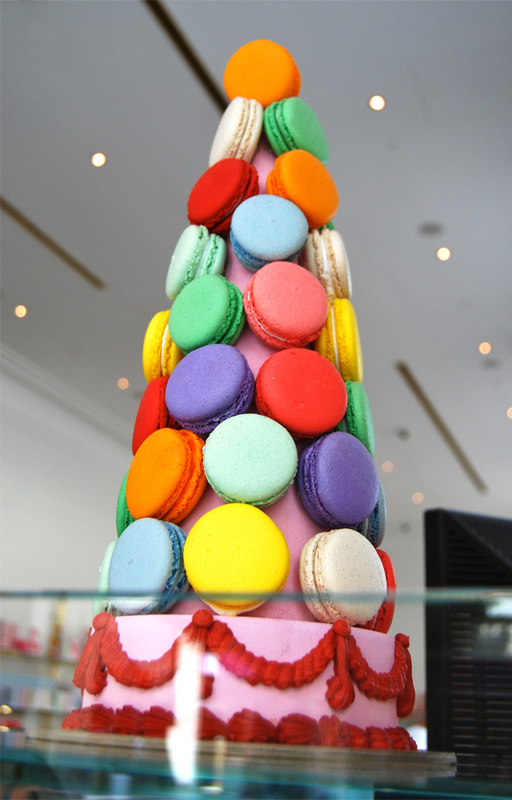 or a breathtaking centrepiece for a engagement party or baby shower I don’t think you can go wrong with one of their macaron towers. Speaking of macarons, I did pick up a pretty purple box of five of their flavours in lieu of a birthday cake. 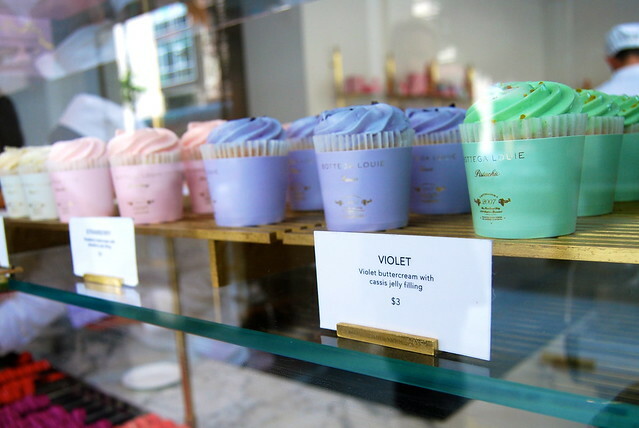 Now, I fully intended to photograph the beautiful box and write flavour reviews and profiles of each one like I did when I went to ‘Lette Macarons in Beverly Hills. However, I just ate them instead. You can scald me for being a bad blogger in the comments section if you are so inclined! Anyway, I had Rose, Salted Caramel, Strawberry, Vanilla and Chocolate Orange. The only two I have particularly strong memories of (they were all very good though) are the Rose, which I thought was nice and delicate, but the flavour was a little over powered by the sweetness of the macaron, and the Chocolate Orange which was tangy and divine with a rich and more-ish chocolate ganache center which I wish I’d had many, many more of. If I were to compare Bottega Louie to the other two macaron examples I’ve sampled in Los Angeles, ‘Lette and the macarons from The Bouchon Bakery I’d say Bottega Louie’s offerings were far superior to the macarons at Bouchon, which were just average, and not as good as from ‘Lette which I thought were a lot better and fresher, with the exception of Bottega Louie’s Chocolate orange one, of course. Looking back at my photos from my trip to the very busy store, where there was just so much to look at, I regret not trying one of these pretty and delicious looking cupcakes with floral flavoured buttercream and preserve fillings. Well, it is an idea for me to try and bake for myself at home, then! 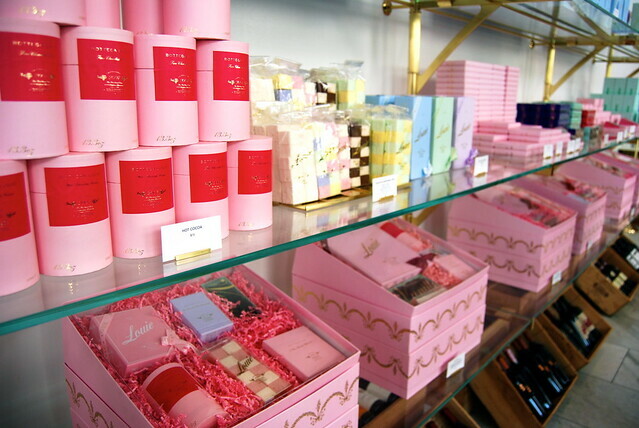 While it may seem like Bottega Louie is all about all things sweet, delicate and sugary, that is only half the story. I stopped there and had lunch in their large French bistro style dinning room as I had set aside my whole day for my trip Downtown. Before I get onto the food, just another thing about their dinning room; it is very, very loud. 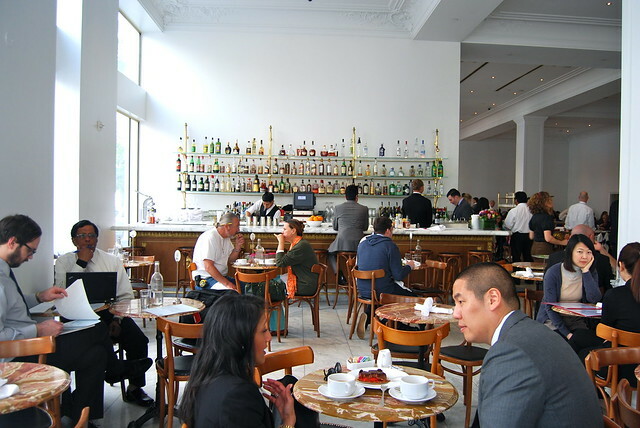 Don’t get me wrong, and all the food being fed to people on other tables all looked as fantastic as mine did, but if you are looking for somewhere to have lunch where you can converse with your companion, don’t choose to dine at Bottega Louie. 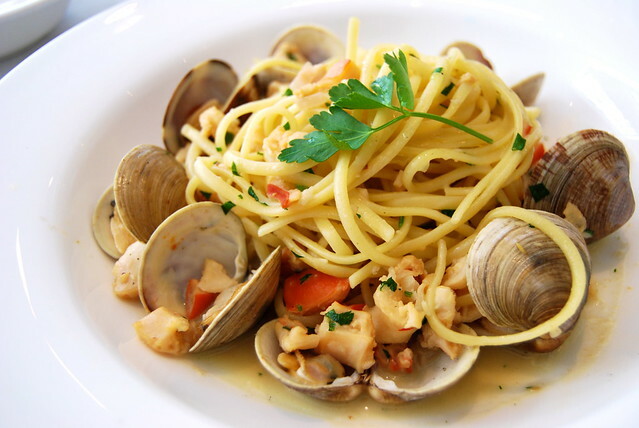 I had the Clam Linguini pictured above which was made with fresh pasta and a delicious and slightly creamy white wine sauce. The clams were well cooked and I really enjoyed the dish; especially the surprise addition of lobster to the sauce which was not listed on the menu. The service was also fantastic, better than in any other restaurant I’ve eaten in in Los Angeles since moving out here, which is why rather than choosing my own dessert from the menu or the pastry cabinet I went with my servers suggestion of the house dessert, a hot chocolate soufflé with a Crème Anglaise sauce. 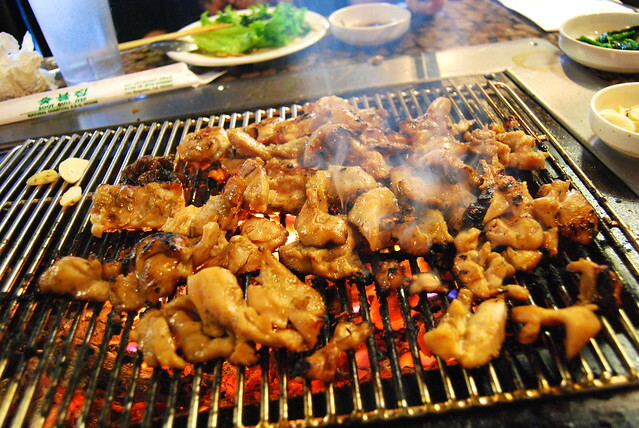 It was good, but nothing to get jump up and down about. 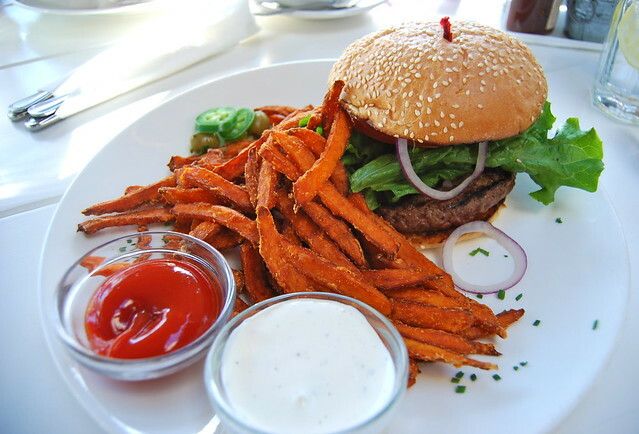 I liked how it was brought to me and sauced at the table, and the Crème Anglaise was pretty perfect; I’d have that part of it again. 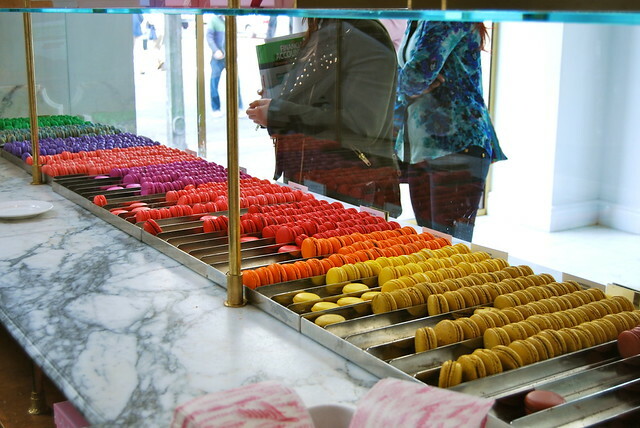 So I had some great recommendations from lots of my Los Angeles readers on places to get fantastic French macarons in LA in reply to my ‘Lette post; where do you suggest I go other than Bottega Louie for exemplary French Patisserie?